All angels are all beauty and all goodness, and when Stuart was young, he had believed it. He still held his face the same way, that flat peace and love and perfect harmony on it, but underneath, something had changed. He couldn’t ask the other angels how they felt, drinking chocolate milk and playing tennis all day. What could he possibly say about winning 23 out of the 46 tennis matches he had played and how it had lost its joy? At the mandatory choir practice three times a week, Stuart still sang the words, hallelujah, hallelujah, hallelujah, but without that glorious light that had shot through him in the past, and then the next time Stuart went to earth, he came home with something more than just a soul. Stuart stole the wind-up rose from a store in San Francisco, and as he smuggled it past customs in his underwear, he felt the last of his goodness go. 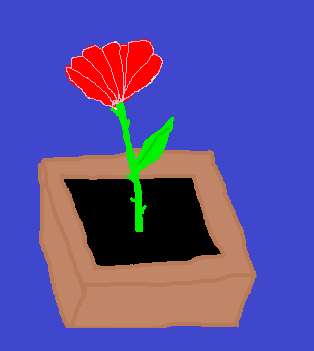 The rose started as a bud in a box, but when he wound the key and opened the lid, Stuart could watch it grow. Stuart would sit on the sidelines at tennis matches, staring down at his lap while the other angels played, listening for the sound of imperfect hinges when the little rose began to open. “Why won’t you ever play?” asked another angel one day. The angel had a chocolate milk moustache and drips of sweat framing his face. Stuart didn’t know what to say. Stuart wondered why he wasn’t in hell where the badness was. What was he doing in this place of all beauty and all goodness when the only beauty he had was in a little box on his lap? Stuart sat still and said nothing, waiting for the other angel to go away. And then one day, Stuart saw another angel with a box in his lap. What has he got? Stuart wanted to know. Stuart slid beside the angel on the bleachers and peaked into the box. Inside was a miniature man struggling to do jumping jacks.